Originally begun as a personal exercise intended to be kept private, “in a box,”1 the “Letters to the Mother” series dominated Elena del Rivero’s artistic production for nearly a decade from the 1990s through early 2000s. Having studied English literature at Cambridge University, del Rivero was inspired to create the series by the undelivered missive written by Franz Kafka to his father in 1919. While visually evoking the unresolved attempt at communication central to Kafka’s text, del Rivero’s artworks shift the intended recipient of the letter from father to mother (and, in related series, are penned as unfinished letters to a young daughter, letters from a bride, etc. ), thereby adopting female perspectives with both personal and universal resonances. 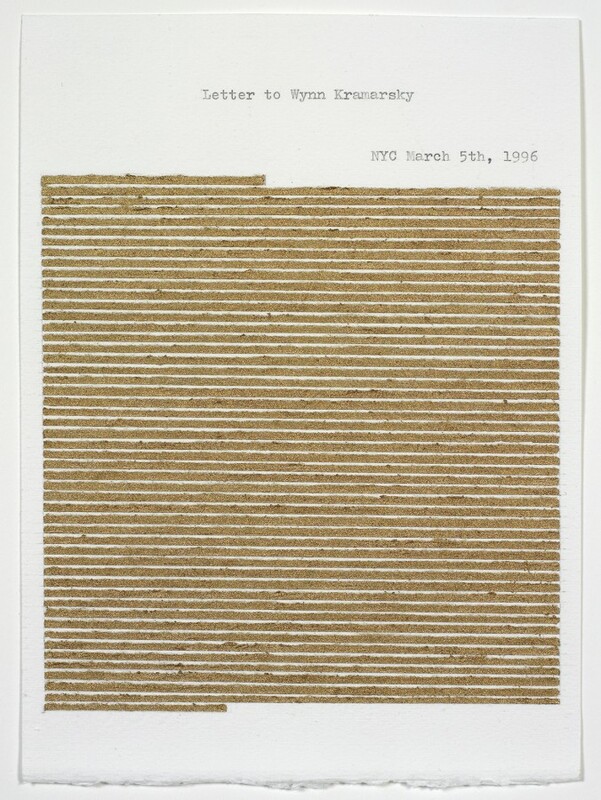 The three examples of del Rivero’s letters on view — Carta a la Madre (1993), Letter to Wynn Kramarsky (1996), and Letter to the Mother (2000) — demonstrate the range of materials, processes, and techniques that del Rivero explored while “writing” her missives. Intimately scaled works on paper intended to recall the size of actual letters, all three works have their titles typed or stamped across the top in a plain font. As simple explanatory declarations, these titles appear in stark contrast to the expressive markings that make up the body of each letter. Indeed, though often erroneously described in terms of a minimal aesthetic, del Rivero’s letters reverberate with barely contained emotion. 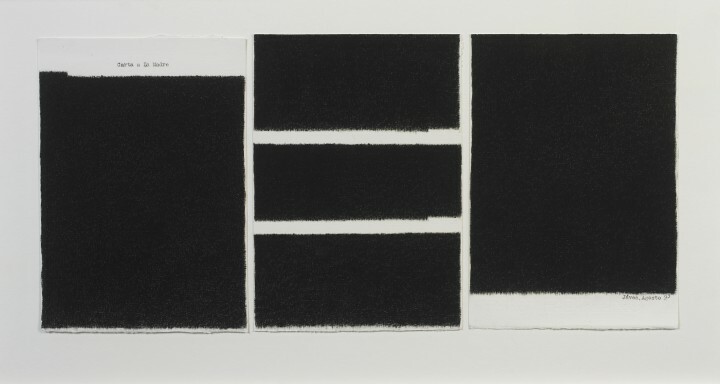 This is most noticeably the case with Carta a la Madre (1993), a work composed of three sheets of paper arranged side by side upon which the artist has filled in areas in graphite. Shaped like paragraphs and ending at various intervals to evoke lines of text, these areas are so forcefully shaded as to appear black, with only the tooth of the paper fibers visible through the medium. It is precisely the mystery of what lies beneath the obscuring forms – if anything – that makes Carta a la Madre such an arresting work. What words are hidden beneath the nearly full page of uninterrupted darkness on the letter’s final page? Was something written and erased? Does the censorship of the paragraphs convey more than any words could have? The only clue can perhaps be found in the typewritten text alluding to the location and date when Carta a la Madre was presumably created (in this case, Jávea, a small seaside town near the artist’s native Valencia, Spain, in August 1993). Similar identifying, if nonetheless still elusive, clues are found on del Rivero’s Letter to the Mother, which is not only dated, stamped, and initialed by the artist, but also bears additional markings that have been tantalizingly covered over by correction fluid. Unlike in Carta a la Madre, the actual text of Letter to the Mother remains visible: a cacophony of irregularly spaced NOs, a word that translates freely between the artist’s native Spanish and adopted English. Despite the legibility of the letter, however, the actual meaning of del Rivero’s many NOs remains somewhat lost, as they appear printed on a torn sheet of paper that has been ripped from its original context and affixed to a larger sheet with thread. Significantly, this thread is strung with dainty pearls, creating juxtaposition between the matte typewritten ink and the luminescent gems. 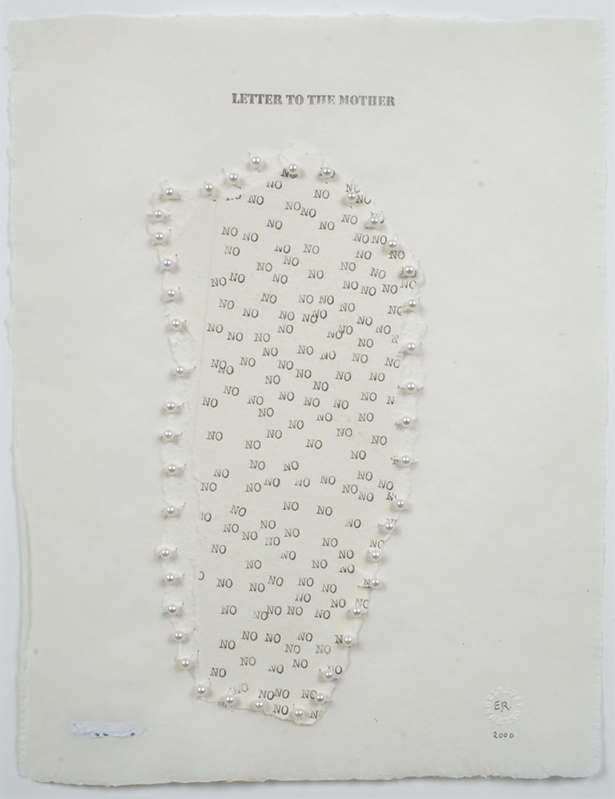 A material used frequently in del Rivero’s oeuvre for its rich symbolism, the pearls in Letter to the Mother thus may be understood in terms of their alchemical associations as healing elements, for not only are the pearls used to help suture the torn paper, but they also help soften the stridency of the ink NOs. Indeed, at times the two mediums fuse into a single form as a rounded pearl takes the place of the letter O.
Symbolism is also present in del Rivero’s Letter to Wynn Kramarsky, the body of which is composed of gold brushstrokes precisely painted to mimic lines of text. Kramarsky was the first to collect works from del Rivero’s “Letters” series, and the use of gold in this letter could therefore allude to the artist-patron relationship. According to del Rivero, however, this drawing is “really all about love” and wanting to “give someone your best.”2 Indeed, though easily overlooked by unknowing viewers, the seemingly insignificant date printed on Letter to Wynn Kramarsky is important in that it corresponds to a milestone birthday for the collector. As del Rivero recalls, the drawing was sent as a gift through the mail. Whether actually sent by post or not, Letter to Wynn Kramarsky represents a delivered letter with sentiments quite different from the more difficult “Letters to the Mother” series–though perhaps equally unexpressible through text. 1. Interview with the artist, New York, May 25, 2012. Elena del Rivero (b. 1949, Valencia, Spain) received her Intermediate College degree (1971) from and studied English philology (1972-1974) at the University of Valencia, Spain. After receiving a diploma in English Literature from the University of Cambridge, England (1977), she studied painting and printmaking at the Estudio Arjona and Oscar Manesi Workshop in Madrid (1978-1984). Del Rivero was awarded the Prix de Rome for Painting (1988). She has since received grants from the Pollock-Krasner Foundation (1991, 2002); the New York Foundation for the Arts (2001, 2002); the Creative Capital Foundation (2001, 2003); and the Rockefeller Foundation, the Bellagio Center, Italy (2005). Recent solo exhibitions have been held at the Corcoran Gallery of Art, Washington, DC (2008); Edificio Histórico de la Universidad de Barcelona (2009); Espacio AV, Murcia, Spain (2010); Galeria Senda, Barcelona (2010); Galería Elvira González, Madrid (2004, 2006, 2009, 2011); Lawrimore Project, Seattle (2011); the New Museum, New York (2011); Jason McCoy Gallery, New York (2014); and Galeria Elvira Gonzalez, The Armory Show, New York (2014). Recent group exhibitions have been held at the Yale University Art Gallery, New Haven, Connecticut (2007); Centro del Carmen, Valencia, Spain (2008); Museo de Arte Contemporáneo Esteban Vicente, Segovia, Spain (2009); the University Art Museum, Albany, New York (2010); Pratt Manhattan Gallery, New York (2011); Universitat de Girona, Spain (2012); MUSAC, León, Spain (2012); Paço das Artes, São Paolo, Brazil (2013), and Galería Acanto, First International Contemporary Art Biennial, Cartagena de Indias, Colombia (2014). Two exhibitions in collaboration with Leslie McCleave were held at the New York State Museum, Albany, New York (2011), and the International Center for Photography, New York (2011). She presented in collaboration with Linn Meyers at Gering & Lopez Gallery, New York (2013). Del Rivero has lived and worked in New York City since 1991. More information about her work can be found at www.the-paraclete.com. Susanna V. Temkin (b. 1985, Miami, FL) is a PhD candidate at the Institute of Fine Arts, New York University, where her research focuses on modern art in the Americas. Temkin is currently working on her doctoral dissertation about the artist Marcelo Pogolotti, a key figure from the first generation of modern artists in Cuba and a participant in the international avant-garde. In addition to her academic work, Temkin is the Research and Archive Specialist at Cecilia de Torres, Ltd., New York, where she is helping to produce the catalogue raisonné of Uruguayan artist Joaquín Torres-García. Prior to these experiences, Temkin worked in various positions at the Solomon R. Guggenheim Museum, New York; El Museo del Barrio, New York; and The Wolfsonian-Florida International University, Miami Beach, Florida. Interview with the artist, New York, May 25, 2012.